Searching for the best dog food container? Look no further! 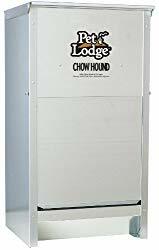 The best dog food container for you will depend on what exactly you’re looking for and how much space you have in your home. But we’ve been investigating the different ways to store dog food. From metal to glass, plastic to wood, soft to stackable, and even some with wheels too! And we’ve got everything you need to make the right choice. Have you ever returned home to find your pooch snout-deep in delicious kibble, with only ragged remnants of the bag the kibble came in strewn all over the floor? Unlike people, dogs don’t worry about eating too much. A dog that loves to eat will eat every chance he gets… unless you find a way to secure all those tasty victuals! 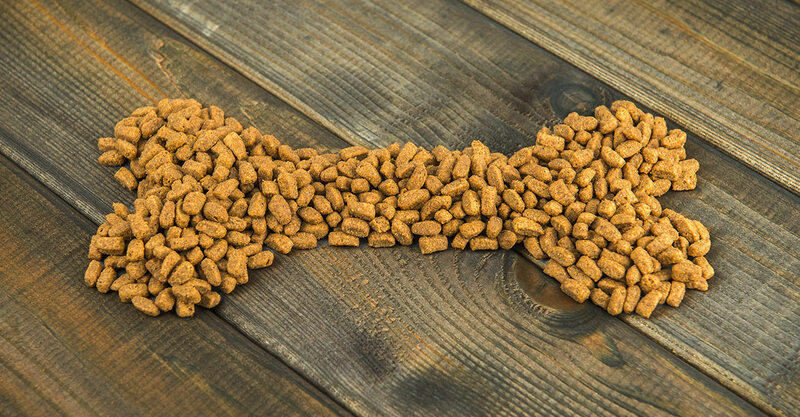 Since most dry dog food sold today is also stored in chew-friendly packaging, this means transferring the kibble from the bag to a container. Even tiny pups can turn into expert snack thieves if the packaging isn’t chew-proof and the prize is tasty enough. So, it’s important to find a dog food container of sufficient sturdiness that can withstand the most determined chewer! We’ve done the research to discover the best dog food storage ideas, and now we present them for your consideration here. Read on for an overview of dog food storage bin products worth a second look! 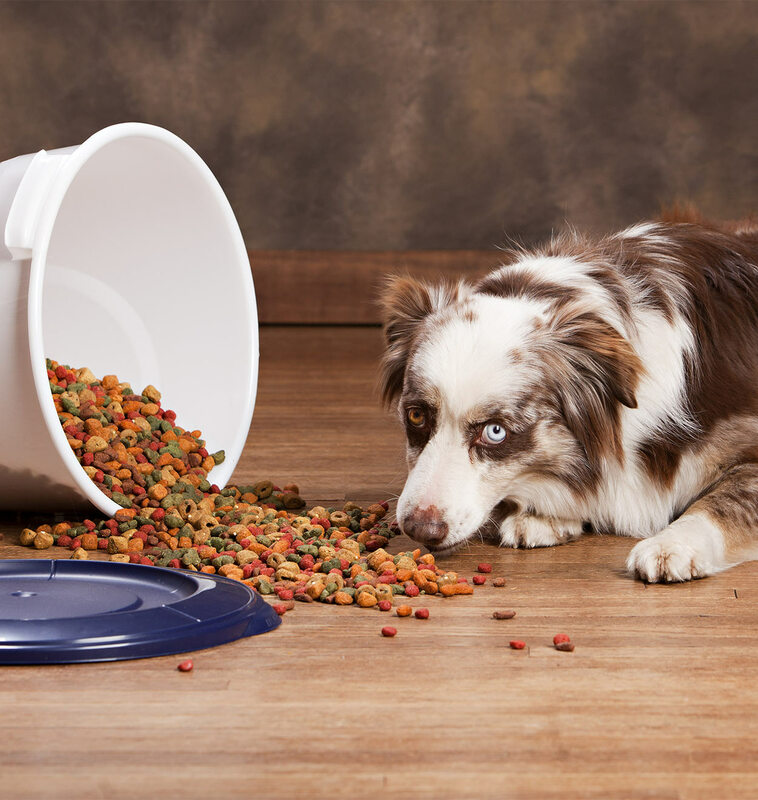 Ask any dog owner what they value most in a dry dog food container, and you are likely to hear the following three traits: a container that is sanitary, sturdy, and safe. Sanitary. 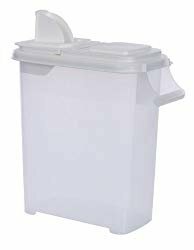 This is priority number one in pet food storage: you want the stored food to stay sanitary and fresh inside of airtight containers between feedings. Sturdy. A sturdy dog food storage bin is one that will resist even your canine’s most vigorous attempts to steal a snack. Safe. Today, research tells us that the safest materials for pet food storage are BPA-free, BPS-free, phthalate-free and leach-free, whether they are made from plastic or some other material such as glass, wood, fabric or metal. What we know now suggests that glass or stainless steel make for the best and safest dog food storage container options over most plastic containers. 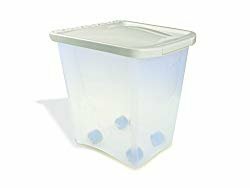 Unless specifically labeled as pet-safe, plastic storage containers can leach out dangerous toxins that impact canine reproduction and endocrine system functioning. However, if you have already invested in plastic containers, there is still a way to store your dog’s food safely. What you need to do is keep your dog food inside its original packaging and then place the entire package inside the plastic container. This way, even if the plastic has been compromised in any way, it won’t directly impact your dog’s food. Keep stored dry or wet dog food away from humidity, moisture or heat. Follow the manufacturer’s instructions on when to dispose of stored canned food that has been opened. Clean dog food storage containers regularly. Keep a close eye on stored wet and dry food expiration dates (this is another good reason to keep your dog’s food in its original packaging). Now let’s take a look at some of the best options you can buy! 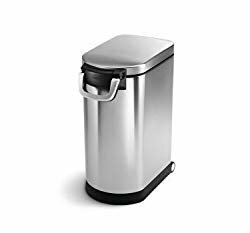 Metal containers have become quite popular as dog lovers learn more about the dangers of certain plastic dog food storage bin products. However, it is important to research any type of container thoroughly, regardless of the material, to be sure it is dog-safe and dog-friendly! We like these three metal dog food containers because they are pet-safe, popular, highly rated by dog owners and attractive! This highly rated and popular galvanized steel dog food storage tin does two jobs. It stores dry dog food and dispenses it too. This particular large dog food container holds 25 pounds of dry dog food and can be wall-mounted. This attractive airbrushed steel dog food storage tin features an airtight seal, a magnetically mounted scoop, a lockable handle, and a removable BPA-free inner bucket. It also has rear wheels to save your back. Sizes are 25 liters (6.6 pounds), 30 liters (7.9 pounds) and 40 liters (10.57 pounds). This decorative dog food container is super stylish and comes with its own matching metal scoop. There are three sizes: 10 pounds, 22 pounds, and a 40 lb dog. Each tin is made of FDA-approved recycled steel with a lockable, air-tight top. 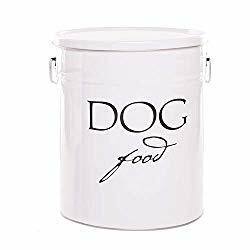 The exterior of this cute container is white with “Dog Food” written in black lettering. These days, glass dog food containers are also becoming more popular as an alternative to the traditional plastic ones. Glass and metal can also be more effective than plastic at keeping heat, humidity, and moisture out. However, because glass can be heavy, it can be smart to only use glass containers to store smaller amounts of dog treats or kibble. Since glass options are somewhat limited, you can also select human glass food containers like the products listed here! 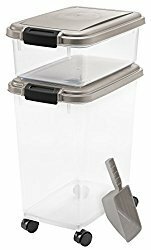 This attractive glass and metal food container can hold 1.5, 2 or 2.5 gallons of dry dog food. The glass walls are thick for safety and the top opening is wide to allow a scoop easy access. This wide-mouth glass jar makes an excellent dog food container. It features airtight closure with an extra screw “lock” to keep your pooch out of the snack jar! The lid is vacuum-sealed for freshness and the glass portion is dishwasher-safe. 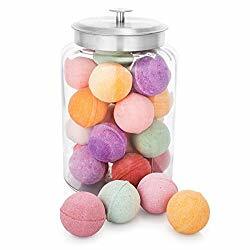 Bormioli Rocco Fido Round Clear Jar. 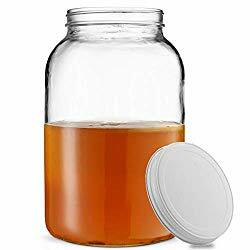 This popular and highly rated clear glass jar from Italy makes a simple but effective container. 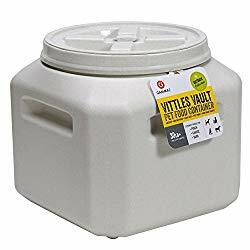 It holds 5 liters (1.3 gallons) of dry kibble or dog treats. The glass is thick and heavy for safety and the airtight seal is made from stainless steel. There is no doubt that managing dog food on the go can get messy. Tired of the awkward process of measuring and scooping kibble into plastic bags every time you and your pup leave the house? These soft dog food storage options are great for travel and for at-home use. 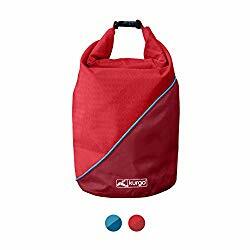 Kurgo Kibble Carrier Travel Dog Food Bag. This surprisingly versatile soft-sided dog food container is perfect for traveling. It has a five-pound storage capacity and is great to take camping or on the road. The material is PVC-free and dog-safe. The container also has an outside zippered compartment for storage and comes with a lifetime warranty. Ruffwear Kibble Kaddie Portable Dog Food Carrier. 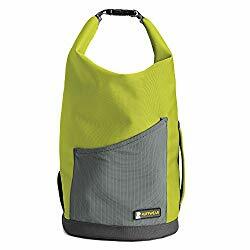 The fabric used for this soft-sided portable dog food carrier is grease-resistant and food-grade. 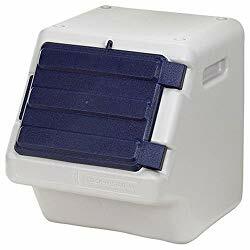 It holds up to 2.6 pounds of dog food or treats and has a built-in “food chute” dispenser on one side. There is also an extra outside storage pocket and a built-in handle for carrying. While plastic has gotten a bad rap lately, this is now changing as pet manufacturers upgrade their materials to reflect the latest research on plastic safety. These plastic food containers are lightweight, economical, secure and sturdy. This cute container has a 26-pound capacity. It features a word-based colorful design on the exterior of the BPA-free plastic container. In addition, it comes with rotating casters for easy relocation and a matching plastic scoop. The highly rated airtight dog food container is very practical. It comes in several sizes and features a lock-down latch for freshness. Choose from 8-pound, 15-pound or 25-pound capacity. 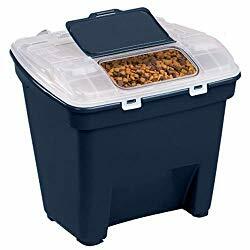 This dog food container 50 lbs capacity at it’s largest size, also comes in 10-pound and 22-pound versions. It features an ergonomic design with front opening for easy scooping. Wood can make a surprisingly airtight and secure storage bin for dry dog food. Of course, if your pup loves to chew on wood, you might want to keep these wood storage bins out of jaws reach! 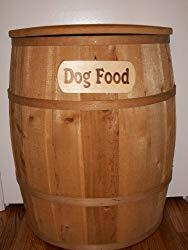 This large round barrel 40-pound dog food storage cabinet features cedar wood. You can use a liner of your choice or use it as-is. The outside of the bin has a sign stating “Dog Food” in a white stencil. When space is at a premium, it sure can be nice to have stackable storage containers for your dog’s food! 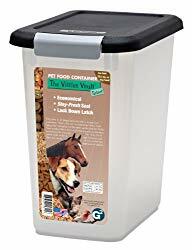 As well, stackable containers are especially handy when you are storing dry food for more than one pet or you need to store more than one kind of dry dog food. This 30 lb dog food container also comes in 5, 10, 25, 50 and 80-pound containers that are stackable. The double-gasket lid ensures freshness. The container has a carrying handle and is dishwasher-safe. This attractive set features two airtight dog food containers and a matching scoop. The larger container is on wheels for easy relocation. Between the two containers, you can store 35 pounds of dry food. These three stackable dog food containers are very handy. They come in 9-gallon, 18-gallon, and 24-gallon size options. Each unit is cream/white with a dark blue easy access side door. It only takes one attempt at lifting a heavy dog food container and the benefits of a container on wheels will become clear! These wheeled containers are lightweight, affordable and simple to use to store large amounts of dry dog food safely. 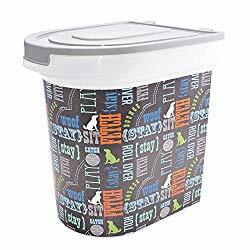 This very highly rated and popular large dog food storage container comes on four wheels and stores either 25 pounds or 50 pounds of kibble. The latch features “positive snap” technology so you know it is truly locked. The plastic is BPA-free and FDA-approved. 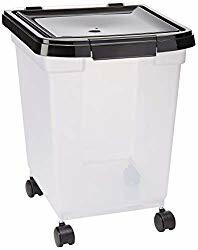 You can choose from two sizes (10 pounds, 25 pounds) for this wheeled container. The plastic is FDA-approved pet-safe and the seal uses fresh-tite technology for an airtight closure. These handy BPA-free, FDA-approved plastic dog food containers come in several sizes (up to XXL). One side has a pouring spout and the other side has a grip handle. Underneath are a rear set of wheels for transportation. Now that you have a good idea of the many options for safely storing your dog’s food, it is time to make your decision! Remember, even the lightest weight dog food container will get quite a bit heavier once you pour the kibble in. So, if you have any back pain issues, you might want to opt for two smaller storage bins instead of one big one. We’d love to know which container you’re using! Is it wooden, glass, metal or plastic, stackable, on wheels or soft sided for travel or something else? Do you use a storage container not featured here? Let us know and we may feature your container in an upcoming article! Schecter, A., et al, “Bisphenol A (BPA) in U.S. Food,” Environmental Science and Technology Journal, 2010. Magnusson, U., et al, “Endocrine Disruptors in Domestic Animal Reproduction: A Clinical Issue?,” Reproduction in Domestic Animals/Wiley Online Library, 2015. CDC, “Pet Food Safety,” The Centers for Disease Control and Prevention (CDC), 2017. FDA Center for Veterinary Medicine, “Proper Storage of Pet Meds, Food, and Treats,” Food & Drug Administration (FDA), 2017. Den Herder, J.S., DVM, “Are You Making These 4 Pet Food Mistakes,” Den Herder Veterinary Hospital, 2018.